1972, Ted Outside Electric Shop. 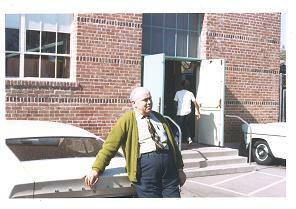 In the photo above Ted is leaning on his Ford Mustang II. The car had callsign license plates - WB6JXY. Behind Ted is Wood Shop. Ted is facing electric shop. Thanks to Danny Waxer, MD, WB6HBC for the photo.